I first met Martin Potter and Anna Grieve in Kuala Lumpur at the Asian Side of the Doc. To be honest, I hardly remember the conversation that took place at that hotel lobby between Martin and I. Everything came out in a flurry – a torrent of words and ideas where people would have to duck, were they to get in the way. We hit it off right from the get go and stayed in touch ever since. What drew me to Big Stories in the first place was that between Martin and I, we shared similar values when it came to our filmmaking approaches. Martin is a seasoned documentary filmmaker whereas I was a fiction filmmaker who accidentally started making documentaries. Whatever the form, we both agreed that we wanted to make impactful films. This is how Big Stories works – Big Stories partners with local filmmakers who will do a residency in a rural town for a month or longer. From there the filmmakers will make a series of micro-documentaries (2 – 3 minutes) while conducting filmmaking workshops for the community. At the end of the residency, these films will first be screened back to the community and then placed onto the Big Stories website for the world to see. This format provides an opportunity to move away from urban stories, which are often the focus of mainstream media. It is also a chance to hand the ‘microphone’ back to rural communities so that they become the authors in their own storytelling. Marshall McLuhan says that “the medium is the massage” and Big Stories borrows from just that. It’s the content that drives the medium and in this case when you’re in a race against time to preserve a rapidly eroding indigenous culture – traditional broadcast documentaries, feature films and books aren’t always the most efficient way to go. They take too long, only certain subjects fit into 30 minute – 1 hour programming segments, and the stories often end with “but the culture is dying”. Really, I’m so over that. Broadcasters usually own all the rights to the material, or the films might be restricted to film festivals before they reach the featured community, limiting these documentaries’ use as educational tools. This inevitably contributes to said culture “dying”, so it’s here that we see the importance of cultural appropriation in how we capture stories. Big Stories attempts to respond to the question – how do we make films about communities, in ways that benefit communities first? Big Stories is a new media micro-documentary project that began in Australia and has since partnered with filmmakers in Laos and Cambodia. Two years after that chance meeting with Martin, together with my producer Beatrice Leong, I’m very pleased to say that we will be the first to bring Big Stories, Small Towns to Malaysia! For six weeks, Beatrice and I will be residing in Kampung Bongkud, a predominantly Christian Dusun village in Ranau town, just three hours drive from Kota Kinabalu. Beatrice and I visited Kampung Bongkud numerous times since January and with the support of Camp Borneo, we have gotten to know the warm and welcoming people of Bongkud. Everyone, the whole village from kindergarteners to the brilliant Chief Bindang will be making films or be involved in telling the stories of Bongkud in their own way. Our team will be calling Kampung Bongkud home starting from the end of April 2015 leading up to the Kaamatan Harvest Rice Festival at the end of May, which is when we will be screening our Big Stories Bongkud films. Kaamatan is my favourite holiday of the year and this Kaamatan will certainly be one to remember. People often talk about it and it has also been a dream of mine to collect and digitalise Sabah’s indigenous stories from its modern history to its ancient mythology. This project is meaningful to me for many reasons. 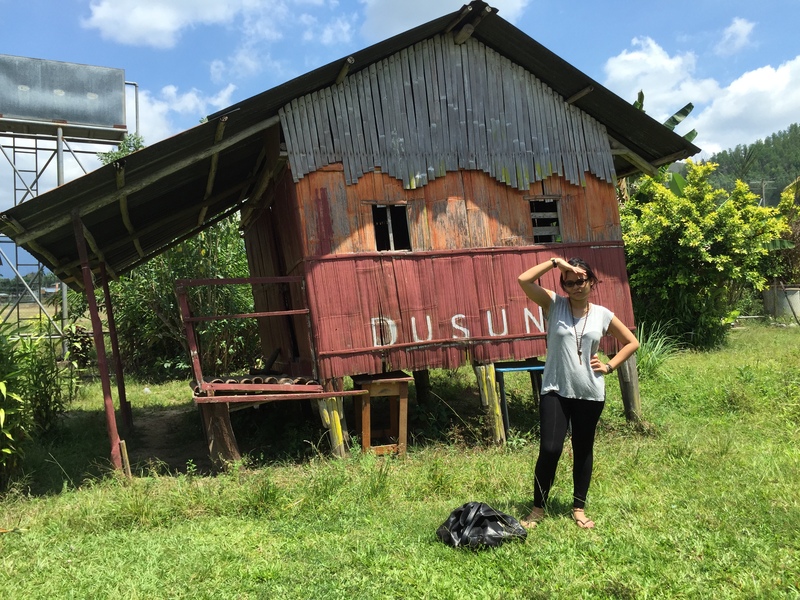 Despite being born and raised in Kota Kinabalu, I was hardly exposed to my own Dusun heritage. It has been this cultural disconnect that has in recent years become fuel for my own films. It is likely that my generation of Sabahans will be the last to see bobolians (Kadazan-Dusun pagan high priestesses) and our native languages are too, fast disappearing. On a positive note, my generation of Sabahans are also the first to actively produce our own media content for a global audience and it’s up to us to put that to good use. To me, modernisation should not mean that indigenous Sabahans have to lose our connection to our roots. Not to put all my eggs in one basket but I see Big Stories as a chance for me to make that dream of documenting my culture come true but on a wider scale than I initially anticipated. I must also point out that much of this is attributed to Beatrice, who is nothing short of a “ninja” of a producer. She’s tiny but she packs a punch (that’s the Kelabit from neighbouring Sarawak in her). Sabah comes from an oral tradition, making its culture vulnerable and there are many cultures all over the world such as these that exist. I am not under any pretense that we are here to “save cultures” from “dying” but it is my hope that through Big Stories, we will be able to empower indigenous communities today to tell their own stories and preserve them in ways that are accessible to the world and for future generations to come. We cannot keep indigenous communities from modernisation but how we document ourselves can evolve. I don’t know if we’ll be successful through Big Stories Bongkud but I can assure you that we’re going to have fun trying. How do i get to watch the movies? Hi Elizabeth – the films should be published on the http://www.bigstories.com.au site at the end of June. Keep in touch with us through social media (facebook.com/bigstories) and thanks for your interest!